For the past few weeks I feel like I've been running non-stop. Work and minnie schedules continue but the rush of holiday shopping, baking, church pageants, chorus and band shows at school, parties, and more makes it just a little bit crazy. Add a wedding shower, dress fittings, and a rehearsal dinner for my cousin's January 1, 2011 wedding to the mix, too. As women, we're often criticized for the way we drive, for being emotional, for many things that could be construed as a negative connotation. You run like a girl. It's not a negative. Girls are strong. Girls are tough. I've been running, and I've been running well. Christmas cards are sent, gifts are purchased, and everything is in order. I'm quite tired, but who wouldn't be after all this running? Do I run like a girl? Yes I do, thank you very much! I don't know about you, but I'm looking forward to some quiet time in January! Merry Christmas!!! This time of year is always crazy. Hope you have some time to rest. Merry Christmas! 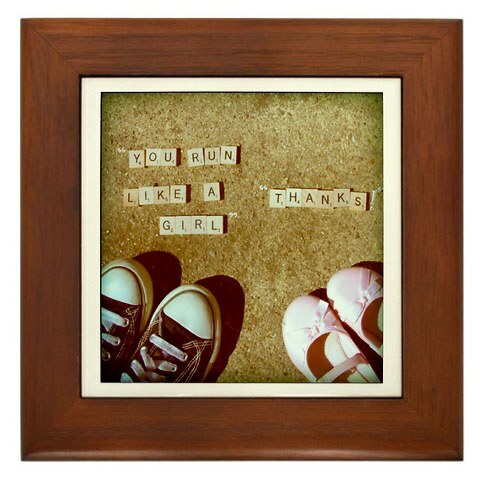 I think we ALL run like girls... And proud of it!! !